No one likes to incur high electricity costs. That’s why the Raychem underfloor heating systems and thermostats are designed to minimise electricity costs. 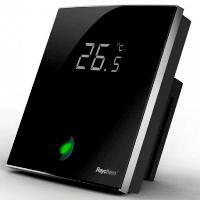 The Raychem Greenleaf Thermostat has a modern look and feel. The thermostat is an “in wall” mounted programmable thermostat for electrical floor heating. - for turning off the Raychem Greenleaf thermostat. - Standard Comfort mode. (1 temperature set point- manual on/off). - Editable program. (4 temperature and time periods per day). • Retrofit. Compatible with other Raychem floor sensor cables. E.g. NRG-Temp. This makes it easy to upgrade your existing Raychem thermostat. • Optimum heat management with 2 sensors. (Ambient & floor sensor). • Reliable thermostat backed up with 12-20 years total care warranty. • Supply voltage: 230V (+10% / -15%) – 50 Hz. • Relay output: maximum 13A. • Floor sensor (external sensor). 1. With 3 metre cable. 2. Type NTC 10K @ 25°C. 3. 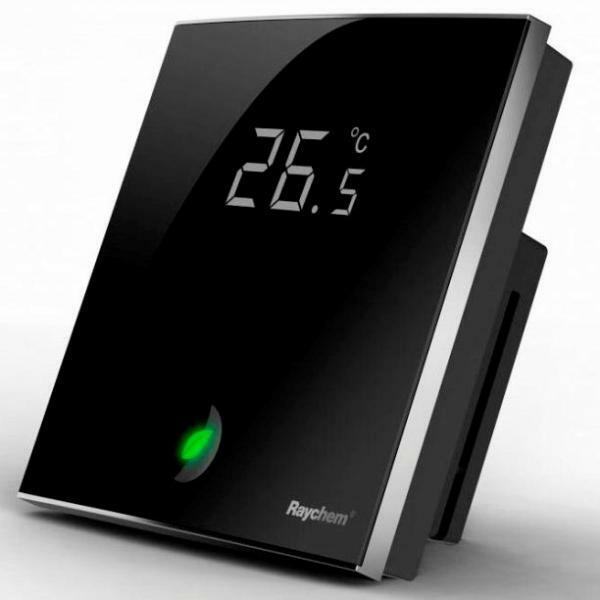 Compatible with existing Raychem NRG floor sensor. CE approved according to the norms EN 60730-1, EN 60730-2-9.